What is Your Actual Return with P2P Lending? Every time you login to Lending Club you are greeted with your Net Annualized Return number on the home screen. But is this the actual return you are getting on your money? Let me share my results with you to give you an idea. I began investing in Lending Club July 2009 with just $500, split between two notes (one of which defaulted after 9 months). As I mentioned in a previous post this lack of diversification was a big mistake. I invested another $10,000 in August 2009 (more diversified this time) and since then I have invested no new money in this account. Last year I did rollover my wife’s IRA into a Lending Club IRA but that account is only six months old so it is too young to really give us a good indication of actual vs stated return. My account on Prosper has been open less than six months as well so I won’t be including either account in this analysis. My main Lending Club account has 304 notes, primarily grades A, B, and C with a median loan age of 15 months. On December 31st, 2010, Lending Club maintained that my Net Annualized Return (NAR) was 7.64%. So, I calculated what my real world return was. It was a very simple process because I had not added or withdrawn money from my account in 2010. My starting balance on January 1, 2010 was $10,792 and my ending balance on December 31, 2010 was $11,547. This equates to a return of exactly 7.0%, or 0.64% less than Lending Club states. Why is there a difference between my actual return and the return that Lending Club states? The main reason can be summed up in one word: cash. The Lending Club formula assumes that all your money is 100% invested in notes all the time. But in reality that can’t happen. Once you decide to invest in a note it will take several days for the funds to be released to the borrower. Meanwhile that money is just sitting there earning 0% interest. Then once you have some loans in place, if you have more than a handful of loans you are receiving interest and principal payments on a daily basis. This money stays in your account earning o% as well until you reinvest it. Lending Club does take into account loan defaults in calculating your NAR, so whenever you have one you will notice a dip in your NAR. Your NAR will change regularly because it is calculated every day for you. If you go for several days or weeks without a default you will likely see it creep up. As you invest in new notes, particularly higher interest notes, you will also see it creep up. Returns include all payments received net of principal repayment, credit losses, and servicing costs for Notes not bought or sold on Folio. Returns are divided by the average daily amount of principal outstanding to get a simple rate of return. This rate is annualized by dividing by the dollar weighted average Note age of your portfolio in days and multiplying by 365. It is a slightly different formula to Lending Club, but I am not an expert mathematician so I can’t provide much feedback as to which one is more accurate. They both take into account defaults and service fees. Anyway, you shouldn’t rely on either company’s metrics, you really should do you own calculation to determine your actual NAR. The good news is that it is relatively easy to calculate your own real world NAR in an Excel spreadsheet. You can use the XIRR function within Excel to do the hard work for you. All you need is a list of all the deposits and withdrawals you made on your account and their respective dates as well as the starting and ending balance. You put the deposits in as negative numbers and the withdrawals as a positive number, then the final balance should be a positive number. Lets’s take a look at this simple example here. On January 1, 2010 $10,000 was invested; three further deposits were made on 2/1/10, 5/5/10 and 6/30/10. 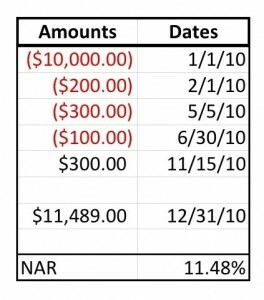 A $300 withdrawal was made on 11/15/10 and the closing balance of $11,489 results in a 11.48% annual return. There are examples and further explanations of XIRR() in Excel’s help as well as here. You see this disclaimer throughout the financial services industry and it certainly applies here as well. The thing about NAR is that it is always going to be best when most loans in your portfolio are young. As of right now the median age of loans on Lending Club is slightly less than nine months. This means that the majority of loans are still very young and haven’t even had much of a chance to default. So, even though the Lending Club claim of 9.68% average returns and Prosper’s claim of 10.4% is technically correct, it is somewhat misleading. In the real world your returns will be less than that as I demonstrated in my example above. Also, the average return for all p2p investors will likely be lower than claimed once all loans have been held to maturity and all defaults have been taken into account. If you really want an accurate picture of your returns on your p2p investments it is important to calculate it yourself. It appears that Lending Club overstates the return by between 0.5% and 1%, and my guess is that Prosper does this as well. It is also a good idea to temper your expectations, because your returns may well go down as your loans age and some defaults become a reality. Even with these lower expectations and overstated returns, I still believe that with p2p lending you can a great return on your money. Excellent job ! That’s a very balanced assessment of p2p returns. It should be “required reading” for all new p2p investors. Thanks Dan. That’s high praise coming from you. As a matter of clarification, it is not correct to state that Lending Club’s formula “assumes that all your money is 100% invested in notes all the time.” In fact, the formula is independent of whether you have money in cash or invested. What the formula does is calculate your return based on outstanding principal ONLY. In other words, it calculates your return based on capital that is invested. As you get payments, some of your capital is returned to you as cash, which does not earn a return, which explains the difference between the real returns on invested capital, and your more nominal calculation of return. Thanks for the clarification, Rob. It is probably more accurate to say it your way. I just wanted to get the point across that the Lending CLub stated return is different from the real world return. If an investor doesn’t bother reinvesting the cash earned from payments and let’s the money sit there earning o%, eventually the LC return and the real world return will be a long way apart. The lesson here for everybody: reinvest your cash. Don’t let it sit idle in your account. Excellent advice. Even getting 1-1.5% in an online bank beats getting 0% at Lending Club. I don’t hesitate to move money out of Lending Club if I can’t find any loans that satisfy all of my criteria. At year end, I review all of my investments, and for 2010, my stock performance trounced my Lending Club performance, which averaged 10% between my two accounts. I am no longer adding any more $$ to my non-retirement Lending Club account, and am just reinvesting the $$ in my SIMPLE IRA at Lending Club. I have had a couple of borrowers default due to bankruptcies shortly after obtaining their loans. I am concerned that word may get out that if you are considering bankruptcy, try to obtain a loan just before, and you’re golden for that 20 or 25k. Has this happened to anybody else? Mike, There are certainly people who try and game the system like this and I have had a couple of bankruptcies very early on in the process. But I believe Lending Club are capturing most of these people before they get approved for a loan. If they didn’t their platform would no longer function. It is hard to get all the scammers but my experience is that there are a very small percentage of people who have no intention of paying back the loan. I hope you are right, Peter. Another one of my loans went late after just one payment…By the way, do you think Lending Club’s format for it’s loan performance data is realistic? Mike, I am not sure exactly what you mean by “format for its loan performance”. I think the performance page in the Statistics section is very useful, particularly when you plug in dates for older loans. However, I think the stated 9.68% return is not a realistic expectation for most p2p lenders. My guess is that return on loans held to maturity will average 7-8%. Which I believe is still quite a good return on your money. Peter – Could you upload your spreadsheet so that we can have a template to work from? Having awful returns on Lending Club – down to 0.5% NAR (ie, after chargeoffs). I stayed with C+ loans, but at this rate I might not get my principle back when all is said and done. Hi Paul, Sorry to hear about your poor returns. I am curious to know how many loans you have invested in. And how much you invested per loan. Do you mind sharing this? I had pretty good returns with 50 or more loans and now at over 130 loans the rate of interest — real life, between 4% and 6%. I don;t think that is bad… better than a savings account , and most CDs of deposit! I also do I bonds, but not certain what interest those give… less than LC but lower risk too. With I bonds, you are risking nothing. So far LC out does the rate in my 401K account through work with Fidelity. , but I’m not trusting that kind of $$ to LC P2P ! Thanks for the article. I am hoping that you can confirm that I used the formula correctly. I started 2014 with a balance of $4,236 and ended with a balance of $21,925. During the year I made 9 deposits for a total of $16,500. I came up with an interest rate of 3.82%, which is considerably lower than the NAR shown on my account page. Did I use the formula incorrectly? If not, why the huge difference? The problem here I suspect is cash drag. When you invest your money it takes 45-60 days to start earning interest on this money. This is because it can take some time to find the loans to invest in then it is two weeks before the loan is issued and then payments don’t start coming in for 30 days after the loan is issued. I assume that you put the dates in the XIRR formula for the day the money was transferred in and given your large additions throughout the year this 45-60 day lag would be a real drag on your returns. But once fully invested as long as you reinvest quickly cash drag is kept to a minimum. Perfect, makes sense. Should have thought of that. Thanks for the quick reply.